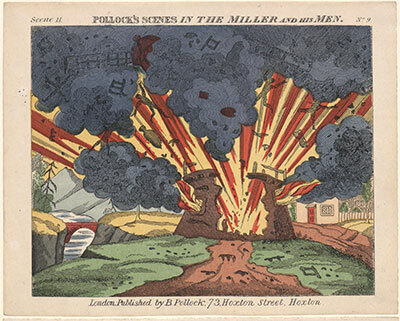 This magnificent explosion helps explain why The Miller and his Men was one of the most popular of the toy theatre plays. With twenty illustrated sheets, some paints, and a pair of scissors, a child could amass all the ingredients of a successful night at the theatre: an evil miller who doubles as the leader of a nefarious gang of thieves, a pair of lovers kept apart by said miller, and the gallant Count Friberg, who orchestrates the reunion of the lovers and the dramatic destruction of the mill. A picturesque windmill, late night smuggling scenes, and plenty of sword fighting keep the action building to the final crescendo that is the explosion. This toy theatre set was published by Benjamin Pollack sometime around the end of the 19th century, but its beginnings may be traced to Covent Garden Theatre, October 21st, 1813 when Isaac Pocock and Henry R. Bishop’s stage version of The Miller was first performed to great acclaim. 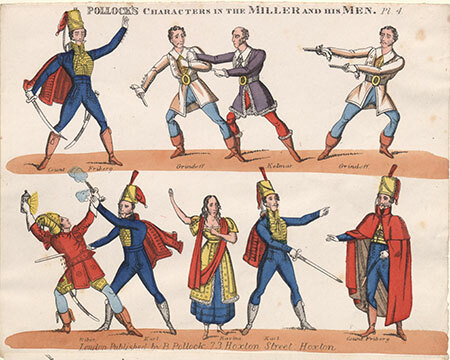 Capitalising on the popularity of plays like this, theatrical print sellers first sold images of the actors and actresses in costume, but were soon selling smaller vignettes of entire scenes and then entire plays. Accompanied by a condensed script, these miniature plays indoctrinated generations of British children into the wonders of the theatre during the 19th century. Miniature theatre enthusiasts included Charles Dickens, Winston Churchill, Robert Louis Stevenson, and Claude Lovat Fraser. This entry was posted on Friday, August 15th, 2008 at 7:25 am and is filed under Nineteenth-Century Entertainment. You can follow any responses to this entry through the RSS 2.0 feed. You can leave a response, or trackback from your own site.